Saint Nicholas of Myra, whose feast is today, 6 December, is the patron saint of sailors and is often called upon by mariners who are in danger of drowning or being shipwrecked. According to one legend, as a young man Nicholas went to study in Alexandria and on one of his sea voyages from Myra to Alexandria he is said to have saved the life of a sailor who fell from the ship's rigging in a storm. 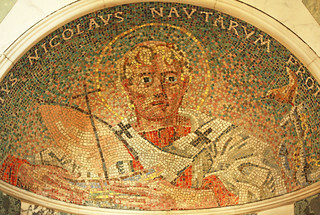 This mosaic of St Nicholas is in Westminster Cathedral in London.